Talking about setting benchmarks and exceptional performance, Apple, seems to be one of the first companies that come into our minds. Apple has not only been able to capture a loyal following, its users are not even willing to buy any products except Apple. Apple iPhones have set up benchmarks so high, that smartphone manufacturer compare their products with Apple to show their products worth. With the last year's success of the Apple iPhone 7, Apple Inc. launched a trio of new iPhones on September 12 - iPhone 8, iPhone 8 Plus and iPhone X. Let's talk about the iPhone 8 here. The iPhone 8 has an All-Glass Design, with a body build of Aluminium beneath the glass protection. The iPhone 8 has a slender body, larger physical buttons on the sides for ease of access. 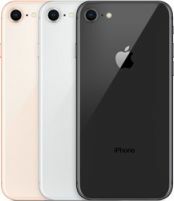 The phone has a fairly blank back panel, with a single camera lens module with an LED flash in a top corner, and the Apple logo at the center of the panel. The front panel has a 4.7-inch Full HD Retina Display panel, with the TouchID sensor at the bottom, speaker on the top, and the front camera beside the speaker grill. At the bottom, the iPhone 8 has the charging port (lightning connector) and the stereo loudspeaker grills. The iPhone 8 meaures 138.4 mm x 67.3 mm x 7.3 mm and weighs 148 grams. The phone has also been designed to be dust and waterproof conforming to IP67 standards. The 4.7 inch Retina display panel has an IPS LCD capacitive multi-touchscreen panel with Full HD resolution. The display is capable of producing images with an amazing contrast ration of 1400:1. The 1334-by-750-pixel resolution at 326 ppi is perfect for viewing great images and visual experience. Apart from that, the display has other features such as the True Tone display, a Wide color display (P3), and is also has a feature unique to the iPhones - the 3D Touch. The typical brightness of 625 cd/m2. Also, Fingerprint-resistant oleophobic coating has been given to prevent any screen blotches. The iPhone 8 performance will be powered by the A11 Bionic chip with 64-bit architecture. The next generation of the Apple processors will also have a Neural Engine embedded in it, and will have an M11 motion sensor circuitry too. The phone will be great device for multi-tasking and effortless working. The A11 bionic chip will have a Hexa-Core processor, with all the six cores working simultaneously to offer a powerpacked performance.The iPhone will have 2GB of RAM, and will come in 64GB and 256GB memory variants. As usual, there will be no expansion option available. The phone will also support only one nano SIM. Graphics processing will be done by an Apple in-house designed GPU that will be tuned specially for AR related apps and games. The iPhone 8 has been fine tuned only for the best possible experience. Under the hood, the iPhone 8 will run the iOS 11, with multiple new features for better accesibility and intuitive UI, a quicktype keyboard for super fluid typing, an all new AR support and an all new redesigned Control Center for controlling your household equipments and appliances. The configuration also includes improved support for Siri with an important feature included - intelligent suggestions in Messages, Mail, QuickType etc. Apple has always been the best at producing cameras with a knack for designing the cameras work in an amazing fashion. Although not the dual-camera module as we were expecting in the phone, the phone will have a 12MP sensor with f/1.8, 28mm lens, that will take super sharp and focussed photos. Phase detection autofocus, OIS, quad-LED (dual tone) flash are obvious features. The sensor will be 1/3" in size, and rest of the features include geotagging, simultaneous 4K video and 8MP image recording, face detection, all smiles mode, HDR+ etc. The front camera will have a 7MP sensor with a f/2.2, 32mm lens optimised for selfies and portrait mode selfies. Apple has taken care of making sure selfies are as focussed as images taken from the rear camera. On the video recording part, the camera will be capable of taking 2160p videos @ 24/30/60fps and full hd 1080p videos @ 30/60/120/240 fps. The camera will be capable of capturing Full HD slow motion videos. Other multimedia options include access to 40 million songs from iTunes store and support for multiple audio formats AAC, MP3, Linear PCM, Apple Lossless, FLAC, Dolby Digital, AAX and AAX+, WMV etc. Video playback supports HEVC, H.264, MPEG-4 Part 2, and Motion JPEG Supports Dolby Vision and HDR10 content. 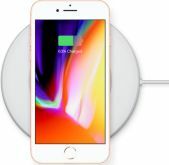 Apple iPhone 8 "Wireless Charging"
iPhone battery doesn't seem to have been upgraded much. The phone will have the same 2650mAh built-in rechargeable lithium-ion battery, non user-removable. The battery will have a talk time of Up to 14 hours, and audio playback of upto 40 hours on all networks. The battery will be capable fast charging with pp to 50% charge in just 30 minutes. Also the phone will support Wireless charging (works with Qi chargers). The iPhone 8 will have multiple sensors embedded -Touch ID fingerprint sensor, Barometer, digital compass, Three-axis gyro, Accelerometer, Proximity sensor, Ambient light sensor. The connectvity options are the best in class - the device connect to all 4G LTE bands, 3G HSPA/UMTS and 2G EDGE/GPRS networks on cellular level. Apart from that the phone will have Wifi 802.11ac with MIMO technology, Bluetooth v5.0 (for connecting to accesories), NFC (for Apple pay only), Assisted GPS, GLONASS, Galileo, and QZSS. The phone has many great features, but also does fallshort of expectations. What kind of display can be expected in the iPhone 8? The iPhone 8 has a 4.7-inch IPS LCD display, dubbed as the Retina display by Apple Inc. Yes, the display is protected by an ion strengthened oleophobic coating. What kind of processor does the iPhone 8 run on? The iPhone 8 runs on the A11 bionic hexa-core chipset. The phone will run on iOS platform and we hope it would feature latest iOS version i.e. iOS 11 using APFS (Apple File System). There have been lots of concept images floating online regarding the upcoming phone. The most reasonable one shows the upcoming phone to be similar to the iPhone 7. The phone is expected to come with a curved display with a physical home button. What kind of battery is installed on the phone? It is believed that the phone will be powered by a Li-Ion battery. Currently, we have no information about the exact specifications of the battery. What kind of connectivity options are provided in the phone? The connectivity options include Wi-Fi 802.11ac, dual-band, hotspot, Bluetooth version 4.2, A2DP, LE, A-GPS, GLONASS, NFC (Apple Pay only), lightning connector(for wired connectivity). Yes, the phone has NFC (Apple Pay only) support. How much storage does the phone have? Would we be able to expand the internal storage of the phone? The phone is comes in two memory variants. One with 64GB and another with 256GB of internal storage. It has been rumoured that the Apple iPhone 8 might come with a 12 MP primary camera and a 7 MP front camera. No, there is no FM Radio support. Is the iPhone 8 dual-SIM supportive? No. The phone supports only one nano-SIM card. Yes, the phone has wireless charging.